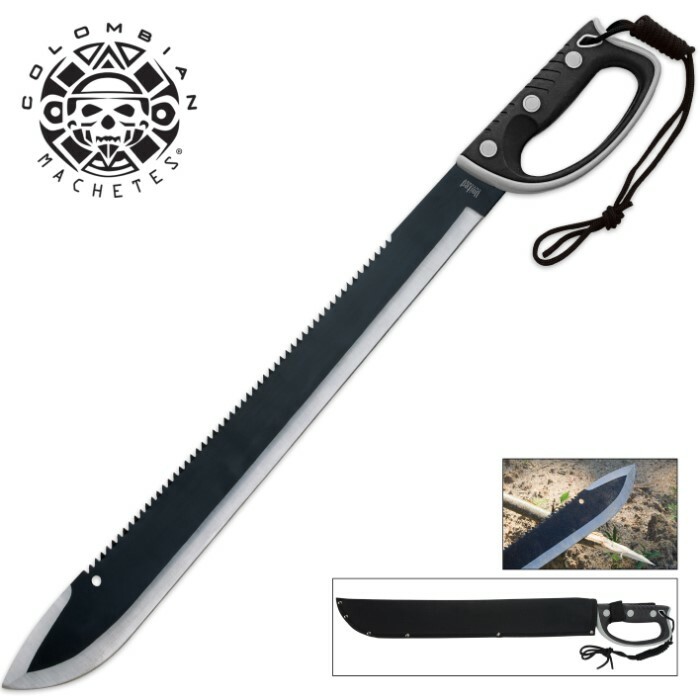 Colombian Sawback Machete, 24 in. This 24 in. 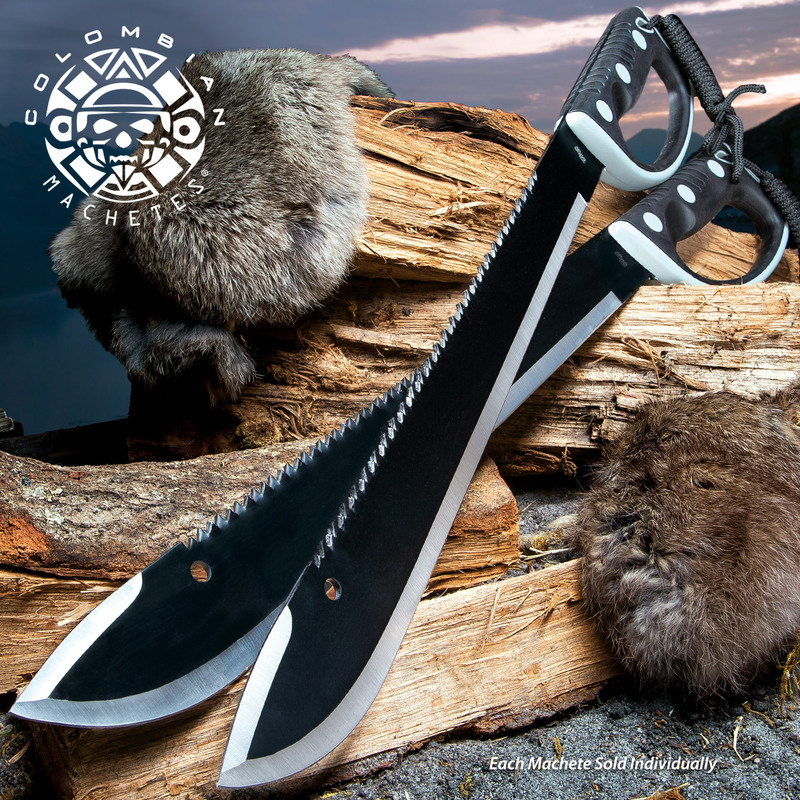 Colombian Sawback Survival Machete features a hefty, thick, full-tang beast of blade that measures a whopping 18 in. in overall length. 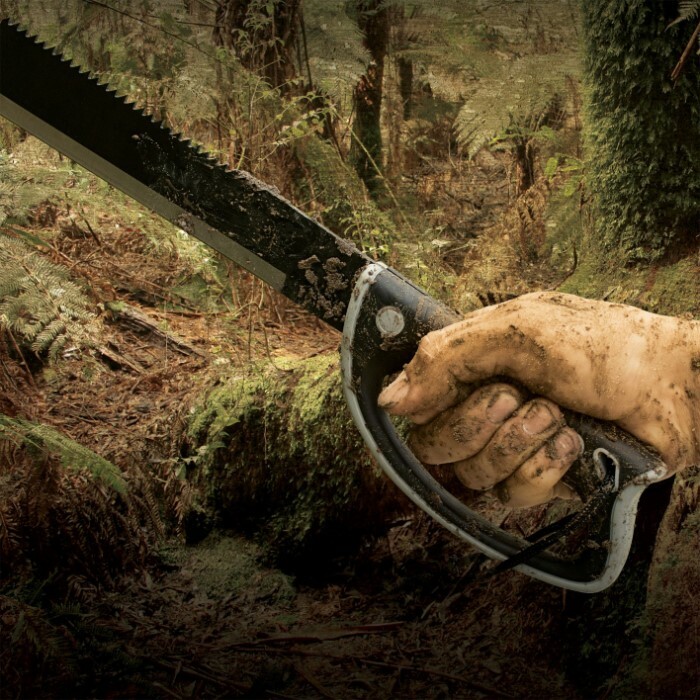 The spine of the blade features heavy sawback serrations that will saw through just about anything you would encounter in your own back yard or deep in the jungles of Colombia. Great product however the description is misleading. Does not come with a lanyard as listed. If it did they forgot to give me one and fibbed when I asked about it. Just got this today. Almost cut myself getting it out of the sheath. Razor sharp all the way to the end. Good comfortable grip. The saw back looks like it's patterned after a regular tree trimming saw. Very nice. Can't wait to try both sides out on something. Or someone breaking in. This is one serious piece of steel. Not only is it razor sharp, it's balanced well and has a great grip. Overall, I am extremely satisfied. As soon as the first one I ordered arrived. I ordered another. The quality is great for the money. This piece is an excellent choice for a multi-purpose blade. It is well-balanced about four inches in front of the grip. Long enough with sufficient weight to manage small trees and brush. Like any long blade, don't try to twist it if you get it stuck in a larger branch, just work it back out and be more careful, it is capable of building a good shelter frame out of smaller saplings and limbs. The steel seems to be a good balance for heavy blades, although I don't exactly know what the mix of UC8088 is. A proprietary mix by United Cutlery probably. Three inches of the tip needs more sharpening if you intend on the machete being used as a defensive blade. The main blade is excellent for camp use and has an edge angle that won't distort if you pay attention to what you're chopping and don't get sloppy. Before it arrived I thought the sawback would require a bit of modification in the handle. I was pleasantly surprised to see the sawback has "draw-teeth". That being the design, the grip is excellent for providing good purchase when drawing the sawback through a piece of wood. 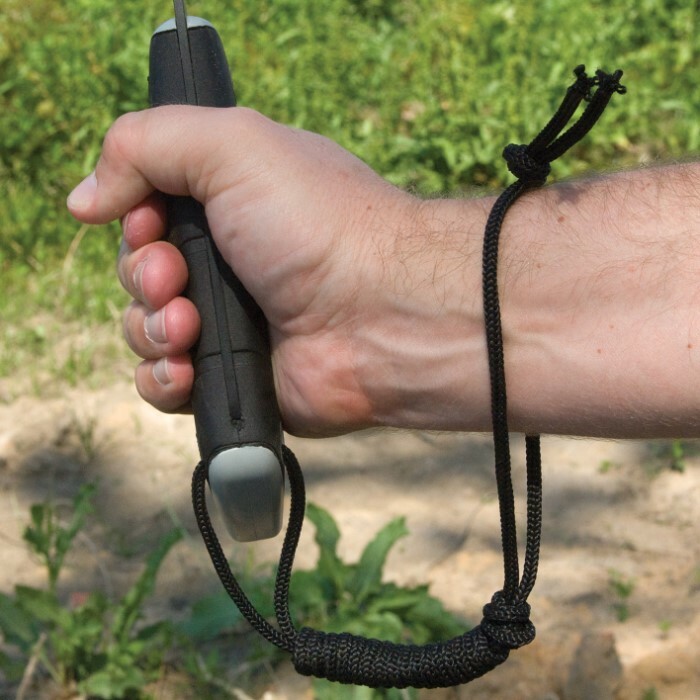 All in all this is an excellent camping or hiking outback blade. And at Budk it is about one-half the "MSRP" price. I'm pleased with it, and have owned other long knives that were not up to this multi-purpose design. EVERYONE BUYS ITEMS TO SUITE THEIR NEEDS. I OWN THIS COLUMBIAN SAWBACK AND THE KUKRI TYPE WITH THE YELLOW HANDLES. EACH TIME I ORDERED, I GOT THEM ON BOGO SALES. SO I AM PLEASED ON BOTH ACCOUNTS! I HAVE NO PLANS FOR JUNGLE TRUDGING. THESE ARE MY PLAN B TOOLS AND NOTHING MORE. I CAN SHAVE WITH ANY OF THEM NOW I RAN THEM ON SOME GOOD DTEEL AND RAZOR STROP.NOT THAT I WOULD TRY TO, BUT YES THAT SHARP! I opted for this machete after I had ordered a BLACK LEGION GREEN KUKRI MACHETE. It seems it was out of stock at the time I ordered it so Budk offered to send me another type. I opted for this one. After reading some reviews here and on Amazon I am convinced I made a mistake. Reviews of breaking and warping blades and loosening handles are not difficult to locate. Maybe I will give this away to my stepson. 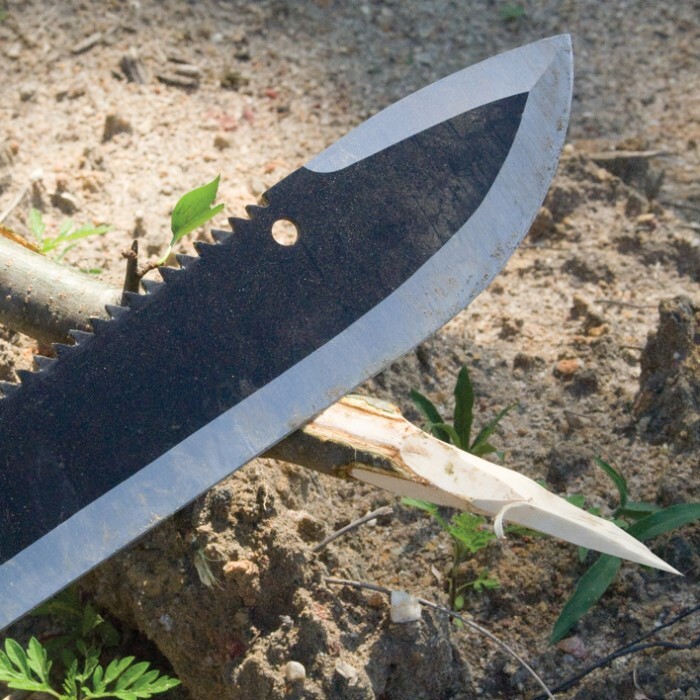 One thing for certain, I would not trust this machete in a true survival situation. I still want the BLACK LEGION GREEN KUKRI MACHETE and I guess I will look for it here, hoping it comes back in stock. On a positive note, Budk has the best customer service I have ever encountered. Worked amazing for awhile, however while cutting down a little tree smaller than the one in the video the blade snapped right in half perfectly, I mean can't expect too much for 20 bucks, it would be awesome to get one to replace this but then again don't wanna risk that happening again.. Overall would not buy again but was fun while it lasted. I live on the edge of the woods and do a ton of hiking and camping. This machete has been awesome. Sharp blade and the sawback is excellent. Great value!